When it comes to centralisation, New Zealand is an outlier amongst developed countries, with decision making heavily concentrated in central government politicians and officials. For every tax dollar spent by local authorities, Wellington spends $7.30. Local Government New Zealand and The New Zealand Initiative have joined up to develop a policy roadmap on just how to devolve and deconcentrate power through our Localism Project. On 28 February 2019, LGNZ and the Initiative will present the first cut of this work at the Localism Symposium. We invite interested parties to come and critique our work in a workshop session in Wellington to help develop a robust framework through which communities can have their decision making powers restored, and share insights into public perceptions of localism and local government. Count me sceptical. I’m unpersuaded the local authorities should get more power. Given the choice between the New Zealand government – of whatever stripe – and Wellington City Council, I’ll take the former any day. Not only are they generally more competent (and regular readers will know I’m no fan of any recent government) but it is a great deal easier to monitor them and hold them to account. Then again, perhaps I’m just a died-in-the-wool central government bureaucrat (“you can take the boy out of the bureaucracy, but not the bureaucracy out of the boy”). But what could one reasonably expect of the council of one of my old haunts, Kawerau (population <7000)? And I’m more than a little sceptical about whether there is any meaning in that reported correlation: after all, the United States has plenty of fiscal decentralisation, but New Zealand is about the same size (population) as the median US state. I’m a South Islander by birth and inclination, and if someone proposed a genuine federal model for New Zealand – South Island, lower North Island, and Upper North Island – I’d probably be emotionally sympathetic to it. But even then I’d refer supporters to the Australian experience, and wonder just how much genuine decentralisation would occur and for how long. Australia struggles to maintain effective federalism. In the material they’ve sent out for the workshop today, there are some interesting ideas I could probably support and even champion. For the rest, I guess I’ll be a voice of critique…..and open to being persuaded that more of the case is persuasive than I think now. I suspect a really compelling case for decentralisation relies either on geography, strong and settled regional identity, or history. We are a small country, fairly recently settled, and there will be few people for whom (say) the sense of being a Taranaki-ite is at least as important as being a New Zealander (unlike, say, the situation in Scotland or Texas). To that point, US state boundaries haven’t changed in a very very long time, while two of the four local government areas I lived in while growing up simply don’t exist any more – abolished at the stroke of a ministerial pen. Had we kept the provincial government system – avoided the Vogel money grab – perhaps we’d now have a similarly long tradition of decentralised government. In days of easy travel and easier technology it is hard to create a stable and enduring constituency – other than local government politicians and officials – for trying to create it de novo. And – although we can’t run the experiment – I’d bet against it having made much difference to things that ail us, like house prices or productivity. I did notice however that the New Zealand Initiative’s enthusiasm for Switzerland – which really does have lots of decentralisation – carries over into the material. The Initiative has long been keen on singing the praises of Switzerland, which is much richer than we are. But, as a reminder to people, here are the productivity growth performances of the OECD countries since 1970 (when the OECD databases start). This is total growth in real GDP per hour worked from 1970 to 2017. Bad as New Zealand’s productivity growth performance has been over this period, Switzerland is still the only OECD country to have had (slightly) less productivity growth. And it isn’t just the early part of the period: for the period since 2000 you need to go to two decimal places to separate the (lower quartile) productivity growth rates of the two countries. Switzerland is rich, and pleasant in many respects. But relative to the rest of the OECD it used to be much richer. Appealing as the Swiss decentralisation seems in some ways – and much of that reflects deeply rooted histories of separate distinct communities, including linguistic and religious differences – it isn’t obvious why it offers some path to better productivity growth in New Zealand. Fixing the housing mess is also claimed as one of the possibilities of the sort of reforms LGNZ and the New Zealand Initiative are suggesting. Did I ever mention – why, yes I think I did – that Switzerland not only has very high house prices, very high levels of household debt, and very low levels of home ownership? Not outcomes to envy. They aren’t (I presume) because of decentralisation, but they’ve happened despite it. Safer banks = poorer society? The Reserve Bank Deputy Governor’s speech yesterday was released under the title Safer banks for greater wellbeing, while the handout at the venue went even further and was headed (in a very big font indeed) Safer banks = safer society. Count me sceptical. It was a disaappointing speech. Plenty of people turned up to the university at lunchtime, including such eminent figures as the Governor and the former Deputy Governor (Grant Spencer), but we were treated to something not much more than the ECON101 case for huge increases in bank capital requirements. Geoff Bascand’s speeches have typically been the most thoughtful and considered of those given by Reserve Bank senior management. This latest effort didn’t reach that standard. Instead we had alarmist rhetoric about history, key charts deployed for support rather than illumination, and no attempt to dig deeper and use whatever that digging might throw up to shed light on the case the Bank is making (in a cause in which it is prosecutor, judge, and jury in its own case). History first. As Bascand noted, New Zealand hasn’t had much history with systemic financial crises (although there is an interesting article here on the two episodes we have had). The first was in the 1890s, culminating in the bailout (and partial nationalisation) of the BNZ in 1894 (and the fiscal cost of that bailout (per cent of GDP) was a bit larger than in the more recent BNZ bailouts). Bascand really only notes this episode in passing but here is the chart of (estimated) GDP per capita during that period. If you ask someone who’s lived through a banking crisis, they’ll likely tell you that the impacts were not only significant, but lasting. Perhaps the person you talk to may have lost their job as a result of the crisis, and if not, it might have been their spouse, a friend, or a neighbour. Maybe you speak to a young couple that had purchased their first home just prior to the crisis, only to see its value decline by 30% in the months following the crisis, forever altering their outlook on the economy and their willingness to make another significant investment. Or maybe you speak to someone who just graduated from university prior to the crisis, only to enter a depressed labour market, and forced to accept work well below their educational qualifications and abilities, forever altering their desired career path. Talk to these people, and I think they will tell you that banking crises have altered their lives in ways they wished it hadn’t. I think they will also tell you that banking crises should not be accepted as an unavoidable fact of life. For those that lived through the recession we experienced here in the early 1990s, you will recall that some industries were decimated, and a generation of workers lost. Many of these workers were not able to re-enter the workforce easily and lost valuable skills while trying to find suitable employment. And while recessions sometimes occur in the absence of a banking crisis, it is common for banking crises to ultimately result in recessions. Actually, most recessions (not just “sometimes”) don’t involve banking crises, and it is asserting that which needs to be proved to suggest that banking crises “result in” recessions. Yes, banking crises often happen at the same time as recessions. Initial waves of bad lending, over-optimism, and misallocated lending often contribute to both the economic downturn and to the banking sector problems. Big increases in capital ratios from already high levels won’t change any of that. Quite possibly any disruptions to the intermediation process associated with banking failures (or near failures) exacerbate the economic downturn, or slow the subsequent recovery, but the Bank cites no studies (and I’ve not seen any) that attempt to separate out those effects. Implicit in a lot of this is handwaving around the poor global economic performance in the last decade, when countries that haven’t had financial crises have (on average) not performed much better than those that have. and the after-effects of an asset price and commercial property boom, with considerable misallocated resources (all of which had occurred fresh out of liberalisation, when neither borrowers nor lenders – let alone regulators – really knew what they were doing, what the relevant parameters and possibilities of the new market economy might have been. In the aftermath, whatever happened to the supply of credit, there wasn’t much demand for it either. So I’m quite happy to believe that the banking crisis itself may have had some economic costs, but if the Bank wants to argue that they were more than a small fraction of overall costs of that period the onus is surely on them to produce the research in support. As it is, (and despite paying little attention at the time to potential financial intermediation channels) the Reserve Bank’s forecasters were surprised by the speed of the economic recovery from the 1991 recession. But I guess it is easier to simply fling round emotion-laden rhetoric about mental health etc. And even narrowing things down to the BNZ problems, it is worth keeping that episode in perspective. The paper I linked to earlier records that the recapitalisation of the BNZ cost around 1 per cent of GDP. Better never to have had to do it, but that is pretty small by the standards of serious systemic banking crises (and, as I understand it, the direct outlay was fully recouped later). Perhaps relevantly to this debate, I was tempted to ask Bascand yesterday if he had any idea what risk-weighted capital ratio the BNZ would have had in the late 80s. Hard to estimate without someone doing some very detailed research, but I talked to someone else who was around at the time who estimates that at present (before the latest Reserve Bank proposals) the BNZ would be at least twice, possibly three times, better capitalised now than it was then. But of course you get none of this flavour from Bascand’s speech, or from any of the Reserve Bank documents published in recent months. One of the areas the Bank has been pushed on is how their proposals compare to what is being done in other advanced countries, They’ve still given no satisfactory answers, not even something as (apparently) simple as an indication of the all-up expected capital ratios (core equity and total) APRA will expect for the Australian banking groups. An apparently knowledgeable commentator here has suggested that the total capital requirements are likely to be similar, but that the Reserve Bank is insisting on a much larger share of that being made up of (expensive) common equity. If true, that would be useful context for evaluating the Bank’s proposals. It is the sort of information they should have presented when the proposal was first released, more than two months ago now. In the speech itself, Bascand included a couple of charts/tables intended to support his view. The first was this one (I’ve added the circling), included in the speech with no elaborating comment at all. The table is taken from a 180 page paper, and is supposed to represent an estimate of where banks in other countries will get to when the Basle III standards are fully phased in. It isn’t clear – from the speech or from skimming through the 180 pages, although I presume there is a simple answer – whether these numbers are minimum required capital ratios or forecast actual capital ratios. I’ve highlighted the numbers for the 75th percentile for the Group 1 banks (which includes the Australian parent banks) and the globally systemically significant (GSIB) subset of those. The Reserve Bank’s current proposals will require the four largest New Zealand banks to have minimum capital ratios of 16 per cent of risk-weighted assets. Actual capital ratios – and it is actual capital ratios that provide the buffer not minima – will be higher again. These are higher than the 75 percentile for the world’s biggest and most problematic (if anything goes wrong) banks. The G-SIB banks are typically complex, and cross multiple national boundaries, and there is no clear or robust idea how any potential failure will be resolved. On any sensible framework you would suppose that minimum capital requirements for such banks would be materially higher than those for vanilla retail banks operating in a single country, with large and strong parents. But not, it seems, to the Reserve Bank of New Zealand. And, as it happens, this table doesn’t help us with one of the biggest differences between the way New Zealand capital ratios have been calculated and those in many European countries (in particular). The minimum risk weights here are generally accepted to be materially higher than those applied in many other advanced countries. Using the same sorts of risk weights used in many other countries, the capital ratios of our banks would appear quite a bit higher. Since minimum risk-weights imposed by the Reserve Bank were typically higher than those imposed by APRA, it would seem unlikely that the difference here is less than the 3 percentage points APRA accepted in their study. And much of this carries over to the new Reserve Bank capital proposals. Among its plans, the Bank is proposing to use a floor such that the big banks (using their internal models) cannot have capital ratios less than 90 per cent of what would be generated if the standardised approach (applying to other banks) were applied to their portfolios. That is one of the changes that looks broadly sensible to me. But apparently most other advanced countries are planning to use a floor of 72 per cent. All else equal, a 16 per cent capital ratio calculated on Reserve Bank rules could easily be equivalent to something like 19 per cent in many other countries’ systems. And not even the 95th percentile of G-SIB banks will – according to the BCBS table – have a Tier 1 capital ratio of 19 per cent. I quite accept the Deputy Governor’s point that doing international comparisons well is hard. But the Reserve Bank has a lot more resources, including membership of international networks of regulatory agencies, than most people reacting to their proposals. And yet they’ve made little or no effort to engage in robust, open, benchmarking against what other countries are doing – not even Australia, when resolution of any problems in the big 4 banks will inevitably be a trans-Tasman affair. It certainly looks helpful to the Reserve Bank’s case, suggesting that current capital ratios (calculated this way) for big New Zealand banks are currently low by international standards and would still be not-high if the new proposals were applied (the Bank assumes quite a small margin of actual capital over minimum required – for reasons that have some plausibility). There aren’t easy right or wrong answers to some of these issues, but the uncertainties just highlight how much better it would have been if the Reserve Bank had engaged in an open consultative process at a working technical level, before pinning their colours to the mast with ambitious far-reaching proposals. As another marker of what is wrong with the process, the Deputy Governor told us yesterday that the Bank will be releasing an Analytical Note on the Bank’s estimates of the costs of their proposals: it will, we were told, be out in a “couple of weeks”, by when two-thirds of the (extended) consultative period will have passed. if you were in a country where much of credit was government-directed (directly or through government-owned banks). But that isn’t New Zealand. if you were in a country that depended heavily on foreign trade and yet had a fixed nominal exchange rate. But that isn’t New Zealand. or no monetary policy capability of its own. But that isn’t New Zealand. or if you were in a country where the big banks were very complex and you weren’t confident you understood the instruments. But that isn’t New Zealand. or if you were in a country where the big banks had no cornerstone shareholder, were mutuals, or where the cornerstone shareholder was from a shonky regime. But that isn’t New Zealand. The case just doesn’t stack up. And, as I noted yesterday, using the numbers the Deputy Governor himself cited, a simple cost-benefit assessment doesn’t seem to stack up either. We are asked to give up quite a lot of income (PV of $15 billion on his numbers) for some wispy highly uncertain probability of easing a recession in perhaps 75 years time. If there is a robust case for what they want to do, it just hasn’t yet been made. At lunchtime I went to hear Reserve Bank Deputy Governor Geoff Bascand make the case for his boss’s proposal to require the locally incorporated banks operating in New Zealand to fund a much larger proportion of their balance sheets with equity capital. I will write tomorrow about a range of other points that were, and weren’t, made. But for now I wanted to pick up just one number he used in making the case. In the course of his presentation, Bascand used a slide which reported the Bank’s view that these changes in capital requirements will lower the long-run level of GDP by a bit less than 0.3 per cent. I hadn’t seen the number before (maybe it was in the documents, in which case I missed it), but what struck me was Bascand’s suggestion that this is “not a very big number”. Looked at quickly, perhaps that is true. But it is a price the economy will have to pay each and every year. Using the standard Treasury discount rate (6 per cent real), the present value of those costs is about 5 per cent of one year’s GDP ($15bn or so in today’s money). The precise number isn’t certain – could be less, could be more – but whatever the cost, we are stuck with it, year in year out, for as long as this policy proposal was in place. And what are getting in return for our lost $15 billion? And that is where things get very uncertain. The Bank will tell us that we are avoiding the terrible costs of a financial crisis. They will quote various numbers at you, but on this occasion Geoff Bascand included a slide in which a typical advanced country financial crisis had a cumulative economic cost (lost output) of 23 per cent of GDP. even these capital requirements are not supposed to spare us from all crises, just keep them to no more than 1 in 200 years. It is the additional reduction in output losses (not the total loss) resulting from these capital proposals that has to be compared to the annual output loss (the “insurance premium” if you like) of simply putting the policy in place. As I noted yesterday, the policy proposals aren’t supposed to protect us from a 1 in 200 year crises, but they should protect us from, say, a 1 in 150 year crisis. Perhaps we – generously in my view, on my reading of the historical experience – take the view that the further increase in capital requirements can save us from a 10 per cent of GDP loss when the crisis happens. We don’t know when in the 150 years the actual crisis will happen, so lets assume that it happens in year 75 (half way through). We could discount back that saving – 10 per cent of GDP 75 years hence – at a 6 per cent discount rate and the resulting present value is about 0.15 of GDP. In other words, the present value of what we save – that quite severe event, but a very long way in the future – is a bit less than one year’s insurance premium. Another way of looking at that number is to take the 10 per cent of GDP (not) lost and spread it out over 150 years. That becomes an annual saving of 0.06 per cent of GDP. In exchange for which we pay a premium of getting on for 0.3 per cent of GDP. It would take a future crisis event hugely more costly to make the insurance even remotely worthwhile. And all that assumes we know that we’ll actually protect ourselves. But we don’t. Up front, we know that the banks at present are pretty strong (as even the Reserve Bank acknowledges, and that is what the stress tests show). There is no chance that this really severe crisis will happen in the next few years. And, on the other hand, there is no pre-commitment mechanism to guarantee that the new capital requirements are kept in place for 50, 75, or 150 years. No pre-commitment mechanism, and no probability either – just look at how often regulatory rules change, in this and many other areas. And while the Reserve Bank’s GDP loss numbers are about long-term levels, there is also the transition to consider. Most probably, in the course of the transition credit will be less readily available. Most probably, during the transition the next recession will occur (not because of the policy change, but just the passage of time and accumulation of external risks), and in that environment banks seeking to pull back on credit or widen margins are likely to result in a bit more of output cost than the long-term estimate. In other words, if the Bank goes ahead with this proposal, we will be poorer by up to 0.3 per cent per annum for each and every year the new rules are in place. There will, most likely be some additional losses in the transition period. And to gain what? Basically nothing in the next few years – lending standards have been sufficiently robust there is no credible way over that period banks will run through existing capital over that horizon, let alone the new higher levels. And beyond that, the annualised gain (or PV of a lump sum saving decades ahead) is just tiny on plausible estimates of the marginal GDP savings higher capital ratios might one day deliver us. To sum up, there are certain to be annual costs, exacerbated in a transition. There is no certainty future Governors will stick to the policy even if it is adopted this year (if they don’t we will have paid the premium and got nothing), and even if they do it would require incredible (ie literally unbelievable) future GDP savings – in the event of a far-distant crisis – to make paying the insurance worthwhile. 0.3 per cent per annum – in a country struggling for all the productivity it can get – might look like “not a very big number”. But the protection it purports to buy us looks to be of derisory, and highly uncertain, value. Against that backdrop, the (capitalised) $15 billion price tag could be spent on a lot more worthy things. The Deputy Governor’s speech attempts to tie the Bank onto the wellbeing bandwagon (“Safer banks for greater wellbeing”). Well, you can buy a really large amount of, say, mental health services (to take a theme from this morning’s Herald – and from Bascand’s speech) with a $15 billion lump sum. The Governor’s proposals to increase massively the amount of capital banks have to have are back in the spotlight. There was apparently a briefing on Friday for favoured media/commentators, but they still won’t lay out some of the basics that (they say) support their claims. One journalist emerged from the Friday briefing and rang me seeking a bit of information (that I didn’t have at my fingertips) that you’d have thought the Reserve Bank would have been proactive about having out there. We’ve seen nothing from them on the expected transition (eg a range of scenarios as to how banks and markets will respond, and what the output and efficiency implications might be) and we still don’t have any analysis supporting their claims that (a) the new proposed capital requirements would be “in the pack” internationally, or (b) that there is a free lunch on offer (more stability and higher GDP). Remember this graph from the Bank’s consultative document. They never spelled out the analysis in support of it – indeed, they largely eschew modelling, suggesting that they really have no idea where that “optimal” point might be (or, thus, whether we might not already be near it, or even above it (in capital ratio terms)). Perhaps in tomorrow’s speech the Deputy Governor might finally set out the case in a more convincing terms – he might even consider discussing why it is that if his boss really thinks big bank failures are what we have to worry about, they plan to still insist on tiny banks having almost as high capital ratios as, say, the ANZ or BNZ. Or why, for example, the Reserve Bank has refused until now to allow Kiwibank to compete on the same (capital) terms as the big banks. Or to carefully recognise that “levelling the playing field” (perhaps a worthy goal) is something quite different – and needs to be evaluated separately – to raising the hurdle for everyone. The case for something like the former might be easy enough to make. The case for the latter really hasn’t yet been made at all. The Bank attempts it with more folksy analogies. That’s generally a good idea – putting a roof on. But when credible analysis – an internal commentary on which was released by the Reserve Bank here – suggests that the actual capital ratios of New Zealand banks are already relatively high by international standards a better analogy might be putting on a whole new roof over the top of an existing one when the existing one was perfectly serviceable and about only five years old. That would be worse than gold-plating, it would be just a rank waste of resources and a whole new layer of regulatory inefficiency. In making this assessment, our recent work makes the explicit assumption that New Zealand is not prepared to tolerate a system-wide banking crisis more than once every 200 years. That is an annual crisis probability of 0.5 per cent or less. 36. We believe a reasonable interpretation of ‘soundness’ in the context of capital setting is to cap the probability of a crisis at 1% (or 0.5% if we wish to mirror approaches taken in insurance solvency modelling). So staff actually thought that a one in 100 year crisis was the appropriate number, but included the 1 in 200 approach almost parenthetically, very late in a longrunning review. In principle, that difference should, in turn, make a big difference to the appropriate minimum capital requirements. In practice, it looks as though the Bank had some capital ratio requirement numbers in mind, and then cast round for some props to support them. As it is, the risk-appetite framework (the 1 in 200 year benchmark) is pretty questionable as a starting point. In part, that is because any well-designed regulatory intervention needs to look at both the costs and benefits of a particular intervention. It is largely meaningless to put a stake in the ground (whether 1 in 100 year or 1 in 200 year) without some robust sense of what the efficiency implications of the resulting interventions might be. There is little sign that any serious analysis of that sort was done before the Governor plumped, late in the piece, for his 1 in 200 standard. But there is also no “state of the art” when it comes to either defining financial crises, the cost of those crises, or the contribution that bank capital requirements could plausibly make in reducing those probabilities/alleviating those costs. That really is the guilty secret here. And it would involve no shame if the people involved were upfront and honest about what we don’t know – there is lots in many areas of life. Instead, largely-imaginary castles in the air are being built and marketed, used by people whose incentives aren’t necessarily that well-aligned with the longer-term public interest. It is worth appreciating just how limited the data really are. Consider that 1 in 200 year standard the Governor articulates. In principle, one might like 10000 years of data – in fact we don’t have much more than 100 years of data, and for not much more than a handful of (advanced) countries. And even of that supposed 100 years of data, a huge number of the observations of actual crises were really a single observation of one (interconnected) crisis, in 2008/09. But even then, these are not physical processes (like storms or floods or earthquakes) we are dealing with, but human ones, and humans change and learn (for good and ill). And there is rarely any serious consideration of the countries that didn’t experience crises, or of what contribution (if any) differential capital requirements made to those outcomes. There is no agreement in the literature on whether the output effects of financial crises are temporary or permanent, let alone how large those effects actually are. It makes a huge difference what you assume. Perhaps it is fine for an academic modeller to drop in some median estimate, but that number will be almost meaningless if plucked from a relatively small number of studies, producing a very wide range of different results. Linked to this (and crucially), it is very rare to see any papers in this area (and the Reserve Bank’s latest consultative document is no exception – although its 2013 cost-benefit analysis supporting the now-current capital requirements did note the point) distinguishing between any costs that result from the misallocation of capital during the boom phase and any costs that results from systemic bank failures themselves. Higher bank capital requirements can probably do something about the latter, but they can do nothing at all about the former – in fact, there is an argument that unreasonably high capital requirements could induce some more reckless lending/borrowing, as banks attempt to maintain rates of return. I’m not aware of any paper that has seriously attempted to estimate separately the two effects (if anyone is, please let me know). Ireland over the last decade is a good example of the significance of this point, as are New Zealand (or the Nordics) in the late 80s and early 1990s. There was plenty of reckless lending/borrowing, on over-inflated assumptions about future asset values, economic growth etc etc. Much of the (building in particular) activity that followed simply involved wasted resources. It wasn’t apparent during the boom – it never is – but the bust is partly about those effects crystallising. If no bank had failed in the aftermath, all of those particular wealth losses would still have occurred, banks and potential borrowers would still have had to reconsider and review their business models, identifying better just what were good credits in thos particular economies. I’m not suggesting that bank failures themselves had no adverse aggregate economic effects – quite possibly they did – but even if you could safely identify all the output losses relative to a pre-crisis trend, it would still no be remotely safe to ascribe all those to the banking failures. And bank capital requirements will only affect the probability of banking failures. One could throw in more points. For example, the Reserve Bank has periodically tried to claim that there is good reason for New Zealand to be more cautious (in setting capital requirements) than other countries because of some specific New Zealand vulnerabilities. But they simply never seriously spell-out the nature of those (asserted) greater vulnerabilities. One might, for example, be more cautious if bank balance sheets were chock-full of complex instruments. Our banks aren’t. Or were very heavily exposed to new and highly uncertain industries. Our banks aren’t. Or if your big banks were co-ops (with little ability to raise new capital if times get tough). But our banks aren’t. Or even if the government’s own finances were severely impaired. But our government’s aren’t. Or if your banks and country were part of a monetary area such that you had no independent monetary policy and no floating exchange rate. That is the situation for much of the OECD, but it isn’t for New Zealand. These are plain vanilla banks, mostly with parents that are among the better-rated banks in the world, operating in a country with a floating exchange rate and robust government finances. But you won’t here those lines from the Reserve Bank – well, you will when they proclaim, in every FSR, that the New Zealand financial system is sound and robust, but not when they assert (as here) that the system is far less sound than it should be and (expensive) core capital should be almost doubled. And then there is question of the appropriate discount rate. If we are worrying 1 in 200 year crisis we are worrying about events that are (probabilistically) a very long way in the future. As even the Reserve Bank acknowledges (page 9, they don’t do their own modelling but they report that of other central banks), studies to date all use discount rates below those required by the New Zealand Treasury when agencies are evaluating potential investment projects and regulatory interventions. Treasury’s latest recommended default discount rate is 6 per cent real. Suppose we are worrying about preventing a shock 75 years hence (the Bank’s proposals envisage that we would still suffer than 1 in 200 year event, but would prevent, say, the 1 in 150 year event) that might cost 10 per cent of GDP then. Discount that 10 per cent loss back at a 6 per cent real discount rate and the present value of what you are trying to prevent is tiny (about 0.5 per cent of GDP even if allow some reasonable productivity growth, such that 10 per cent of GDP 75 years hence is quite a bit more than 10 per cent of today’s GDP). A 6 per cent discount rate is, itself, ludicrously low in this context: it is not like evaluating a known technology (recall all those highly uncertain points I discussed above). There are reasons why private businesses typically use hurdle rates of return well above estimated firm weighted average cost of capital (essentially what the Treasury numbers are based on). Apply a higher discount rate – even just take it up to 10 per cent real (just 4 percentage points above the Treasury-estimated WACC) – and the estimated future GDP savings 75 years hence reduce to near-invisibility. You do not then need many costs upfront (say in the proposed five to seven year transition period, almost inevitably spanning the next recession) for this proposed regulatory intervention to fail the simplest sort of cost-benefit assessment. And this current proposal is the whim/preference of one Governor. He will not be Governor is 75 years time. Most likely he will not even be Governor 10 years from now. So there is no pre-commitment mechanism. We could end up paying all the transitional costs only to find that 10 years from now some new Governor, some new government, some new studies all end up concluding that – actually- the sorts of risk-weighted capital ratios we have right now were really just fine after all. On Ian’s assessment, the Bank’s material scores, shall we say, poorly. The costs of the policy receive little attention. It is admitted that the higher capital requirements could make it more expensive for New Zealanders to borrow, but the Bank claims that the impact will be ‘minimal’ and that they have taken it into account. However, even on the Bank’s own assessment of 8 basis points for each percentage point increase in the capital ratio, the cost to New Zealand will not be minimal. It is likely to cost around $1.5 billion per year, and possibly more. The present value of the cost of the policy could reasonably be assessed at $30 billion. …. A homeowner with a $400,000 mortgage could be paying an additional $1000 or more a year. This is the number that appears in the decision document. A figure of 6 basis points appears in the consultation document but there is no explanation for the difference. The central question that is addressed in this paper is whether the benefits, (‘being more resilient to economic shocks’) are worth more than the $30 billion. Our assessment is that it is not. New Zealand could secure nearly all of the benefits of higher capital by increasing tier two capital, as the Australians are proposing to do, at about one fifth of the cost of the Reserve Bank’s proposal. The Reserve Bank has not seriously considered this option. The Bank’s assessment that the banking system is currently unsound [implicit in the proposal to require such huge increases in capital] is at odds with rating agency assessments and borders on the irresponsible. The rating agencies’ assessment of the four major banks is AA-, suggesting a failure rate of 1:1250. Ian concludes that using credible inputs to established Basle models, the Governor’s 1 in 200 year target would be adequately met with lower minimum capital requirements than we have at present. Perhaps all the answers will be in the speech from the Deputy Governor tomorrow. Whether they are or not, this far-reaching proposal needs much more robust analysis in support. Declarations from the oracle of the forest really are not enough. Hours worked are an input (which comes at a cost) not an output, so higher hours worked aren’t automatically a good thing. There are good dimensions to it, if (for example) people are coming off long-term welfare back into the workforce, or older people are keen and able to stay in the workforce. Hours worked per capita also gets affected by different demographic patterns – they will be lower in countries with lots of under-15s or over 70s. But, equally, part of the story of New Zealand in the last 25 years is that we have managed to limit the deterioration in our GDP per capita, relative to that in other countries, by working more. Productivity would be better. Over the full period since 1990, here is the change in hours worked per capita for New Zealand and the other Anglo countries, countries with reasonably similar demographics to our own. 1990 was the year just prior to a recession in many countries, including New Zealand, and is a not uncommon jumping-off date for looking at the experience of New Zealand since the reform era. Since the post was almost four years old, I was curious whether anything much had changed. Here is the same chart, using data from the Total Economy Database maintained by the Conference Board. Something of a recovery in Ireland, but otherwise not much. The difference between New Zealand and the other countries in the chart isn’t mainly a cyclical story, but even in the last decade a larger proportion of New Zealand’s per capita GDP growth has come from working more hours (per capita). I had a quick look at a wider group of advanced economies (OECD + EU + Singapore and Taiwan). For the full period since 1990 there isn’t complete data for all countries (gaps mostly the former Communist countries of central and eastern Europe), but of the 32 countries for which there is data, hours worked per capita dropped by 1 per cent for the median country (up 16 per cent in New Zealand). 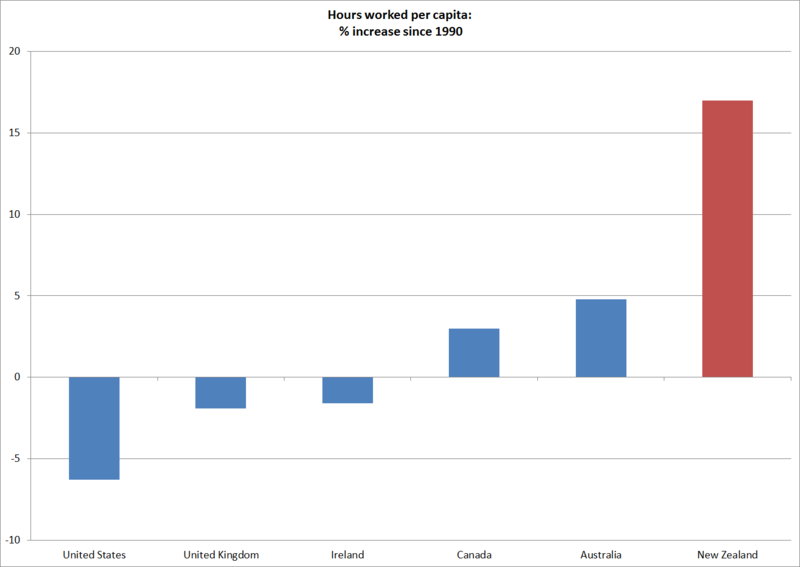 For the more recent period, where there is full data, the median country spent 2 per cent fewer hours per capita working, while in New Zealand median hours per capita increased by 2 per cent. I am not trying to draw any particular policy conclusions from these numbers, just to highlight them. And it is not as if New Zealanders had been leisured people at the start of the period and were only now getting back to advanced country norms. In fact, by 2017 we had among the highest hours worked per capita of any of the 40+ countries in my sample (Singapore is off-the-charts high, and South Korea comes second). As a reminder, hours worked are an input not an output. High (or increasing) hours worked is generally not some achievement to be celebrated, although there can be some caveats to that. If the unemployment rate had been particularly high at the start of the period, one might genuinely welcome it dropping. Involuntary unemployment is, almost by defintion, a bad thing. But when my comparisons started (in 1990) New Zealand’s unemployment rate was about the middle of the pack for the Anglo countries in the charts (by 2007 we had the lowest unemployment rate of any of them). If you are uneasy that the welfare system accommodates too many people not working who should be providing for themselves, then successful welfare reforms might increase average hours worked per capita and that might then be regarded as a good thing – whether fiscally, socially or whatever. The proportion of working age adults on welfare benefits (ie including the unemployed) did drop quite bit in the 1990s and early 2000s. But it was 10 per cent in 2007 and it was still 10 per cent in 2018. Tax system provisions (or the interaction with pension rules) can also deter people from working when they might otherwise choose to. New Zealand has a public pension system that specifically does not deter people from staying in the workforce after age 65 if they so prefer, and between 1990 and 2007 we increased the NZS eligibility age by a whole five years. Personally, I think that was a desirable change, but the fact remains that high and rising hours worked per capita has not been a complement to some stellar productivity performance and improving opportunities. In aggregate, more New Zealanders have been working more hours to – in effect – offset some of the relative income loss that our disappointing productivity performance would otherwise have led to. As a country, our tenuous grip on upper-income status (really not much more than upper middle-income these days) is sustained only by working ever harder. That might be, in some sense, an appropriate second-best (for the individuals making those choices, reluctantly or otherwise). It is not obviously any sort of first-best outcome.